Wondering how you’d set up the X-Session Pro? Here are Eric’s Ableton Live assignments for the X-Session Pro: some obvious choices for 2-channel mode, with a few twists (like using the transport controls to navigate Live clips). Mouse over the image to see what he did, or view the full flickr photoset. Eric Richmond is a “deep house DJ who was looking for a dedicated MIDI controller for ‘standard’ 2 channel mixing.” Amidst all the buzz about M-Audio’s new X-Session Pro (XSP) DJ-style controller, even before it had been released, it’s been hard to get solid information on how the gear works in the real world. Eric took the plunge early and brings us some hands-on testing from the DJ booth. The XSP is a new MIDI controller by M-Audio set to replace the older “X-Session” MIDI device, and attempts to replicate the standard 2-4 channel audio mixers with which most of us are familiar. Getting the XSP to work in Live 5.2.2 (my DJ tool of choice) was a snap. Just load up Live, press the “MIDI” button, and assign away. No problems/gotchas here. My first test was going to just be a standard 2-channel DJ gig, so I assigned things in a pretty standard way. The EQ knobs went to each channel respectively, and two of the aux knobs went to aux send levels for each channel (where I had various effects). Volume sliders, crossfader, and the start and stop buttons were standard as well. Instead of using the “cue” buttons for cueing, I decided to use the “pitch” sliders as independent cue volumes for each channel. This way, I could easily mix the two channels in my headphones, independently of how the individual volume sliders were set up. With the cue buttons, I set one to toggle “loop on/off” for the selected clip in live. I mapped the sets of REW/FF buttons to moving around the session view in Live. This way, the only time I had to touch the mouse was when I was dragging in a clip. Once I did that, I could use the REW/FF buttons to navigate session view to the correct clip and use the start/stop buttons to fire them off. This setup worked extremely well: I had only used the XSP for a few hours before the gig, but since it felt like a standard mixer, it was obvious what was doing what, and I didn’t make any mistakes. If anything, it was pretty liberating rarely having to look at the computer screen — there was none of the dreaded “he’s checking e-mail” syndrome that people complain about with “digital DJs”. The X-Session Pro next to the Trigger Finger drum controller, also from M-Audio. Notice how compact the X-Session Pro is. Kontrol DJ – A good friend of mine who DJs in Traktor uses this, and it’s an AMAZING controller, and is perfect for Traktor. Unfortunately, it does not map to Ableton Live that well. 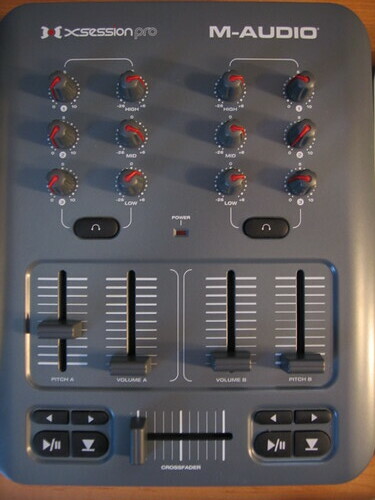 Faderfox LV2, DJ2, DX2, LX2 devices – I know someone who has a couple of these, and they’re amazing, but the problem was I couldn’t find a combo of any two of them that gave me “everything” I wanted. Plus, they’re quite pricey, and at that price point, I would want things to be perfect. M-Audio Trigger Finger – Before getting the XSP, I was using a TF as my main mixing controller. While it actually worked OK (I could use pads as EQ kill switches, which was sweet), I was leery of using other banks for one-shots and fx. Since the TF does not tell you which bank is loaded in the LCD display, I was fearful that I’d be in the wrong bank, trying to do the wrong thing. So, what’s the verdict? In my case, it’s EXACTLY what I was looking for. Now when I have “standard” DJ gigs, I have a perfect controller just for that task. No more making a wacky Trigger Finger bank to try and fake it. The only thing I would have liked to have seen were kill switches for the EQs, but again, for $100, it’s hard to complain. I know people will say “but the power of Live is being freed from two channels; I want to mix 13 clips at once and I only want to use one end-all-be-all device while doing it!” If this is the case, then this is not the device for you. With the XSP able to handle my “standard” DJ gigs, I can free up my Trigger Finger to be a wacky FX board, as well as programming a couple of banks for triggering one-shots and loops.